7 Reasons to love Reason 7…. Reason 7 is coming VERY soon, and it’s all grown up!! For a while now, Reason has seemed to live in the shadow of the main DAW’s. Indeed for many people it was a long way behind the pack in terms of features as well as how seriously it was taken, but Swedish software house Propellerheads have given the mixer, rack and sequencer a major makeover, and now it stands revealed as really very good indeed. Capture your ideas with a minimum of mouse clicks and menu actions — version 6 of Reason introduces unlimited hard disk tracks and rock solid audio recording in Reason. With Reason’s now legendary non-destructive time stretch, you can actually record first and pick your tempo later. Reason has a unique twist on the concept of time and tempo. Change the song tempo and all your audio tracks will follow right along without any need for pre-processing of any kind. Need to slow your song down to nail a tricky passage? No problem. Just reduce the tempo, record your performance and bring the tempo back up. The audio quality? Amazing. 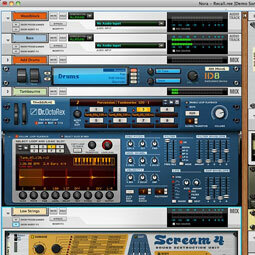 Included with Reason is a huge sound bank full of inspiring instruments, synth patches, loops, and effects. Patches have been created by producers like Death Cab for Cutie’s Jason McGerr, Bomb Squad’s Hank Shocklee, Black Eyed Peas’ Printz Board, DJ Lucky Date, Kill the Noise, and more. It also comes stocked full with thousands of patches, presets, and loops to get you inspired and started. Over 4,000 instrument patches, 1,000+ mixing/mastering effects, and nearly 3,000 loops… it’s enough to satisfy even the most eclectic tastes. For those who like to keep score at home, here’s a breakdown of the factory sound bank content which has been expanded in Reason 6. With Rack Extensions the Reason rack opens up to third party developers. This is not another plugin format – Rack Extensions are full Reason rack citizens, giving you the same great experience as any other Reason device. Load them in Combinators, route cables on the back, automate all parameters, and experiment with the safety of undo. 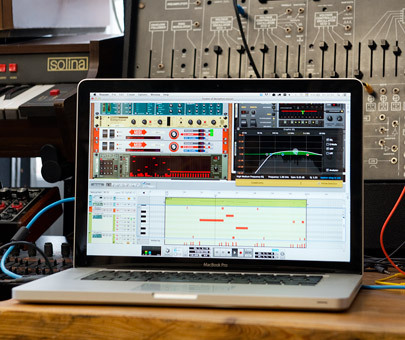 Within the new Reason 7, there is a new MIDI Out funtionality which allows users to connect to external hardware instruments, this allows Reason users to stay synced when working outside of the box. Propellerheads were the people behind REX files, and Reason is of course capable of creating them from scratch. If you haven’t worked with REX files before, now’s your chance to experience the ease and flexibility of these little guys. In fact there is actually a dedicated .REX file player called Dr.Rex. This really is an excellent instrument and not allows you to load .REX files, but also gives you the tools to completely transform them if you wish. The Dr.Rex player has a straight forward but powerful synthesis engine, and the real beauty of it is that both of the envelopes clamp down on each slice independently. This can create some really interesting effects. There is also a sync-able LFO which can be routed to various destinations. Once you loop is playing back in a way that you are happy with, a MIDI file to trigger the loop in exactly right order can be generated and easily assigned to a track in the Reason sequencer. 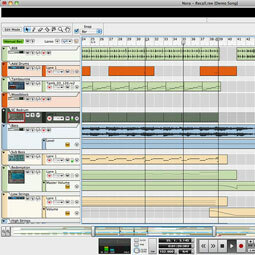 It is also easy to export the same MIDI information to another sequencer in Reason via Rewire. James is an old buddy of mine from our days at KORG USA in the ‘90’s. James is one of the few people I know who has been making beats, squeaks, dirty basses and all the other types of sound so beloved of today’s Dubstep crews, since the early ‘90’s. His legendary sound design knowledge has been put to great use, in a series of phenomenal tips and tricks for Reason, which can be found here….. Previous PostKOMPLETE ULTIMATE 9, IS HERE!!!!!!! !Next PostScan Pro Audio Webcast: What did you miss?